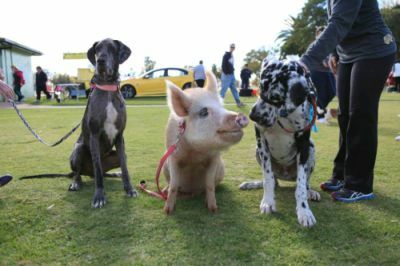 The “Bush Telegraph” program on the Australian Broadcasting Corporation’s Radio National recently launched an exercise on Facebook involving a so-called “free range” piglet. 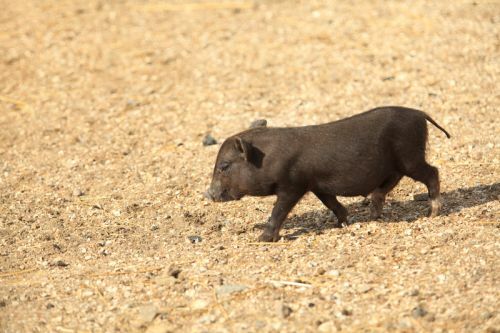 The piglet was selected from his litter to carry the pre-determined name of Wilbur 101. I prefer to call him Wilbur, without the number. Stuart and Tammi Jonas of Jonai Farms in central Victoria have agreed to let you decide how best to rear one of their pigs. They’ve given Bush Telegraph custody of a newborn male Large Black piglet called Wilbur 101. Wilbur 101 will be ready for slaughter by about Christmas, between now and then it’s up to you to vote in regular online polls and decide how best to be a free range farmer. The first decision was whether or not to castrate Wilbur. The “no” vote won, but as in all decisions involved in the exercise, the farmers reserved the right of veto if they believed the majority decision would be contrary to Wilbur’s interests. Implicit in the exercise is the assumption that we have the right to control the lives of animals from before they are born, when we decide to impregnate the mothers-to-be, until we decide when and how they will die. The supposed benefits of free range farming, relative to the alternatives, seem to sit within those parameters. While better for animals than alternatives such as factory farming, I find free range farming unacceptable, as I do not believe we have the right to control animals’ lives solely for our benefit. Cameron Wilson: And Stuart, it’s important to point out here that we’re talking about a food production system; our program is not taking hold of one of these piglets as a pet at all, this pig will be ready for the kitchen table by the end of the year. Stuart Jonas: Yes, and just back-tracking a little bit, I don’t personally like the word “processed”. We don’t process production units; they are living, breathing creatures that we care for, and at the end of the day, they are food and we do send them to the abattoirs and then cut them up, ready for meat products on our table. But just a personal choice of mine, I steer away from the word “processed”. We kill them, we cut them up and then we eat them. Cameron Wilson: Killed and butchered? I struggle to hear much compassion or empathy in Stuart’s comments. I doubt they’d provide much comfort to Wilbur. The most prolonged suffering I’ve ever had to witness was in New South Wales when a free-range pig was approaching the stunner. She was hysterical, frothing at the mouth. Her chest heaved and caved as she struggled valiantly and continuously to escape. I ached to yell out, “Stop, enough!” and hold her in my arms, soothe her, give her a drink of cool water, then take her to a safe place. Smoke rose from her temples as the man held the electric stunner firmly, longer than normal, to both sides of her head. Lee McCosker: I think it should be noted that all rational discussion on the actual question asked has ceased and the voting has become about should we eat meat. The reality is that 5,000,000 pigs are slaughtered here every year and sabotaging this post is not going to change that. What we can change is how these animals are farmed and educate the meat-eating public. Trying to force your choices onto others is fruitless. I understand why you have chosen not to eat animal products but you are a minority. Lets get back to the question at hand or forget it. Either way it will not change Wilbur’s fate. Sensible discussion however may impact on how he lives until that final day. Paul Mahony: Lee, just because we are the minority now, doesn’t mean we will always be. Whatever the decision, Wilbur is being treated as a commodity. Would a pet dog or cat be treated this way? People should respect the right of all animals to live and to be treated with dignity. That includes the avoidance of forced breeding programs. What right do we have to bring animals into the world, simply to be killed for food? Humans are the only species that controls other species in that way. Although domestic pets are regularly sterilised, the procedure is not related to any desire to eventually consume them as food. A particularly interesting aspect of this exercise was the initial decision that anaesthetic would not be used if Wilbur was castrated. That decision reflected standard practice of Stuart and Tammi Jonas, but was contrary to Section 15.2 of Humane Choice’s standards for pigs. The farmers’ position in this instance seemed to reflect the lack of uniform standards for free range farming. Based on feedback received on the Facebook page, the farmers subsequently decided that anaesthetic would be used if Wilbur was to be castrated. Michael Trant: Look at it this way. Livestock are raised to be eaten. They get access to feed, water, protection for predators, immunized against disease and other such. Compare that to a wild herd of wilderbeaste [sic]. When the rains don’t come, no one is there to feed out hay, make sure their water hole still has water. If one breaks its leg, no one is there to put it down, instead it hobbles along for weeks until it either dies from starvation or a lion crushes it throat. Nature is a cruel mistress, and the price livestock pay for not having to worry about all those nasty things is they get a quick death and we eat them. Anyone who thinks a natural death in the wild is better than a knife to the throat has frankly lost touch with nature. Paul Mahony: Michael, why are we forcing animals to breed for our benefit, when we could probably overcome world hunger without relying on them as a food source? The scale of the horror involved in animal agriculture goes way beyond what animals, through natural breeding, would ever have experienced in the wild. 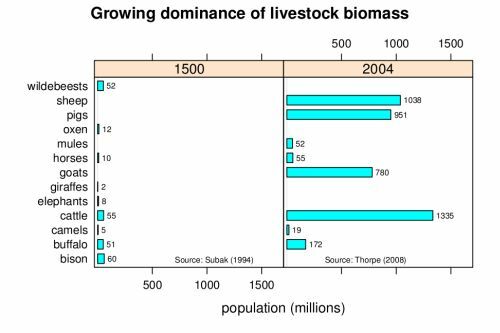 The chart “Growing dominance of livestock biomass” in this post gives some idea of the numbers involved. Geoff Russell, who created the chart, has pointed out that current livestock populations dwarf natural populations that preceded them. Ironically, on the day that voting ceased (three days after it started), I was able to post this comment on Facebook, following a post from Edgar’s Mission Farm Sanctuary. It highlights the true nature of pigs, as intelligent and sociable animals. Go Polly! You’re a magnificent ambassador for your species, and for all animals. In conclusion, I argue that it’s time to move on from entrenched social, cultural and commercial conditioning. In the words of the Vegan Society, UK, it’s time to make history. Well done Paul. Hopefully the exercise will expose aspects of the farming process that people were not previously familiar with. This, in turn, is likely to influence people to make changes that improve the lives of animals. Specifically, not eating them.